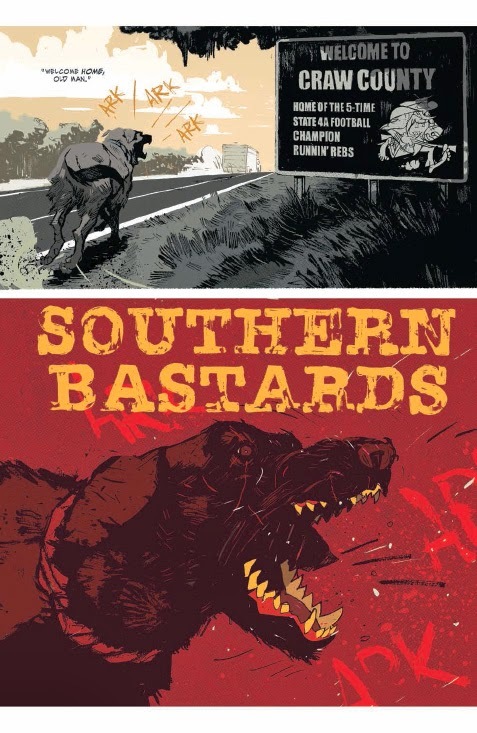 Southern Bastards is a new crime book written by Jason Aaron and illustrated by Jason Latour. Much like the lead character, we're a stranger ourselves in this tale of a town hiding something rotten. Although the mysterious, crime-ridden small town is a familiar theme, the creative team here brings a sense of grime and authenticity that makes this book interesting and will serve the series well. As the story begins, there's a man driving a moving van on a country road leaving a voice mail message for someone; we've crossed into Craw County, Alabama, home of the 5-time state champion "Runnin' Rebs". The man's name is Earl, and he's come back to his hometown to clean out his family's old house. While he's at the house he pays his respects to his father's grave (next to which a large tree has grown - it's been a while) and Earl remembers a time when his father, the town's Sheriff, beat up a number of men outside the house. Next, Earl goes to a diner owned by "the Boss" and is approached by a man named Dusty who knew Earl years before, and who warns Earl to get out of town. Dusty is desperate to see Coach Boss (apparently the "Boss" is also a coach; there's a lot of emphasis on football in this town); unfortunately things don't go as expected, and Earl ends up saving Dusty's life from others who work for Coach Boss and who, well, don't really seem interested in letting Dusty go talk to Coach. Dusty warns Earl that he shouldn't have gotten involved. Later on, Earl comes back to his house, and the book ends on a dramatic back-and-forth sequence of Earl cutting down his tree while things end pretty badly for Dusty. This was a solid debut issue. 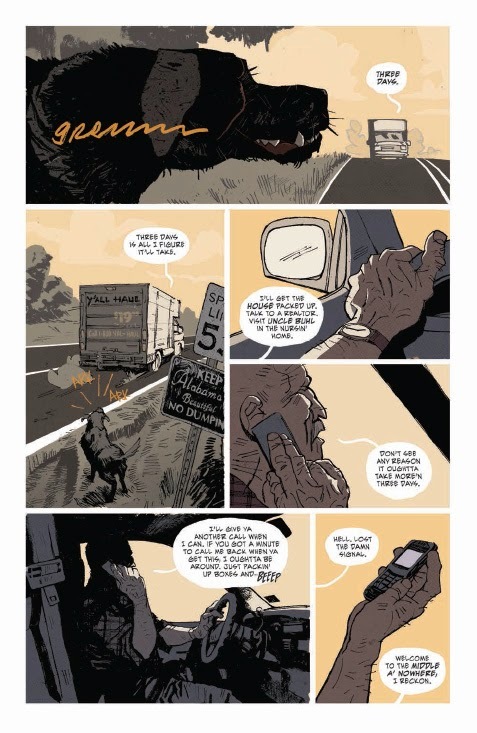 The skillful artwork (and particular artistic choices) from Jason Latour set a tone here; the first image we see is a dog taking a dump on the side of the road directly under a number of signs for local churches (Thor: God of Thunder this is not). From the first page, the washed-out colors and rough lines give us a sense of the story to come; these colors are contrasted with the bright red that colors the flashback scenes of violence from Earl's childhood. There's also a slight sense of ugliness that permeates everything and everyone. The story feels familiar; it brings to mind the movie "Walking Tall" and other stories of one man going up against a corrupt figure that controls a small town. We don't know much about Earl. He was a great high school football player, and his father was once a sheriff that went after criminals with a big stick (again, like in "Walking Tall"). He's also got an instinct to get involved and help people, even though he's just in town to clean out the old house and put it up for sale, and even though its clear he fled this town a long time ago and doesn't want to be back. This is a promising start to a series. 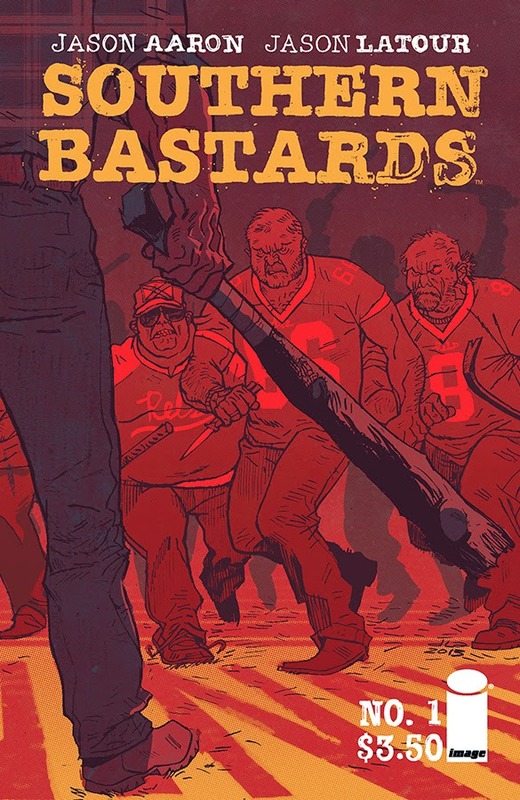 Come for the crime, the high school football and the BBQ; stay for the strikingly illustrated tale of a (seemingly) good man reluctantly getting in over his head.